Michala Banas on drunk texting and boy trouble … it must be our penultimate shoot day! Please Note: to our knowledge, Michala hasn’t actually drunk texted – not around us anyway! But as far as her character is concerned … well, you’ll just have to see the episode to see what we mean!! On one of the coldest nights in August in Melbourne, the Shakespeare Republic team embarked on our latest filming adventure – Michala Banas’ episode tackling the Bard! Filming in my and Billy Smedley’s lounge room in Melbourne, Michala gamely jumped in the deep end with both feet and brimming with some rather brilliant ideas. My strongest memory from Monday’s shoot will be the laughter. I do love all my Republic peeps, but especially when we’re laughing as much as we did on Monday. 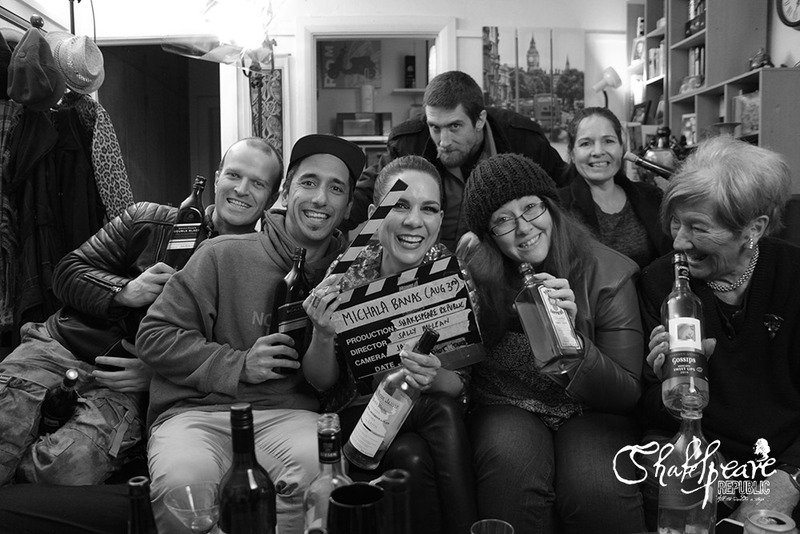 While not a huge apartment, we managed to fit everyone in (somewhat) and shoot a really fun episode involving a coffee table full of half-empty bottles, lots of dry ginger ale (no drinking alcohol on set and anyway, we didn’t need it! ), seven people and all the equipment. Huge thanks to the funny, talented and rather brilliant Michala for her sterling work in front of the camera and for being her usual generous self behind it. You always know you’re onto a winner with an episode when the crew are also hugely enjoying the work being created in front of them, and Michala’s ep was no exception. Huge thanks also to my fabulous crew: Producers Billy Smedley and Perri Cummings for not only their awesome support, but their wonderful “background” work as party guests for the episode, James Dene (DOP), Tim McCormick (Sound/Gaffer) and Marg Woodlock-McLean (Unit/First Aid). Thanks also to Marg for the lovely potato salad and Perri for the scrumptious soup and pastries! Dinner was fab! And so, we’re now onto prep for the last ep of the season … thank you to all the amazing cast and crew to date – the filming has been so much fun and the footage looks fantastic. We’re nearly there peeps! ‘Till next we speak, see you anon. Posted On 06/08/2015 in Behind The Scenes, Project Updates with 0 Comments.Tagged: cast, filming, michala banas, news, web series. ← Shakespeare Republic Launch Party Announcement!